Kids Inflatable Pools & Slides. Intex 2650 GPH Saltwater System & Sand Filter Pump Swimming Pool Set 28679EG. 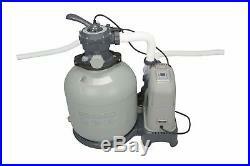 Intex Krystal Clear 2650 GPH Sand Filter Pump & Saltwater System Model 28679EG. Intex's Sand Filter Pumps use a powerful 0.75 horsepower motor to achieve a 2650 GPH water flow rate 2150 GPH System Flow Rate. The pool owner is able to easily operate the unit in 6 modes: Standard Filtration, Backwash, Rinse, Re-circulate, Drain and Close. Sand Filter Pumps are the lowest maintenance option, requiring sand replacement only every 5 years on average. This is the Eco-friendly Pool Water Filter & Sanitizer! Intex combines the powerful 2650 GPH Sand Filter Pump with the next generation in saltwater systems for above ground swimming pools. The Krystal Clear Saltwater System with New Copper Ionization algaecide technology. The Saltwater System combines a unique two-stage technology to sanitize pool water. First, undetectable levels of natural swimmer safe chlorine is produced when environmentally friendly natural salt is added to the pool water and it passes through titanium coated electrolytic cells during the filtration process. The result is soft, fresh, clean water without the potential harsh side effects of packaged pool chemicals. Second, with the new Copper Ionization feature, highly active disinfectant ions are also released which creates a potent biocide that attacks algae more aggressively than chlorine or other packaged pool chemicals. Copper is an all natural bateriacide. Sand Filters represent approximately 38% of pool filtration systems, compared to 27% for Diatomaceous Earth (DE) systems. Sand & Cartridges filters are growing while DE filters are declining due to the increasing number of municipalities that are banning them. Timer Feature- Set the timer to the desired operating hours. 2, 4, 6, 8 or 12 hours. Turn the pump on by pressing the timer switch. The filter pump will filter the water and stop after the operating hours are complete. The built-in timer will operate for the number of hours selected automatically at the same time each day. Operating hours can be re-adjusted if necessary. The pump can also operate continuously by pressing the "l" on switch. Everything ships complete with all parts. This Filter Pump System is designed for use with Intex brand swimming pools with 1 1/2 plumbing. Adapters are not included for Intex pools with 1 1/4 plumbing. Intex brand pools say "Intex" in large white letters on the pool wall. If your pool does not say "Intex" on the pool wall, it is NOT an Intex brand pool. We do not guarantee fitment with any other brand of pool or any non pool application. 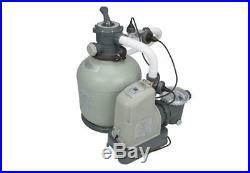 Heavy duty 16 sand filter - requires approximately 100 LBS of sand (sand not included). Simple to use and easy to operate filter that will outperform your standard cartridge filters. Powerful 0.75 HP / 2650 GPH keeps your water sparkling clean (pump flow rate: 2650 GPH, system flow rate: 2200 GPH). Easy operation 6-way valve makes maintenance easy, giving options to backwash, rinse, recirculate, drain, filter and close system. Strainer basket included on pump prolongs the life of the sand and is easy cleaning. Built-in 24 hour timer enables you to set automatic filtration times for the pool to save on daily maintenance. GFCI electrical protection, works with your standard 110-120V Outlet. 38mm hoses with female threaded ends supplied. Ideal for (but not at all limited to) Intex pools such as: Ultra Frame 24' Ultra Frame, Rectangular 24' x 12', Wood Grain Frame 16'8. Saltwater system combines a unique two-stage technology to sanitize your pool. Intex 2650 GPH Sand Filter Pump & Saltwater System Combo Model 28679EG. Two Intex 1 1/2 Screw On Hoses. We deliver to 85% of the Continental US in 3 Days or less! We truly appreciate your business! Windy City SuperStore is here assist you. Please see individual item return policies for specific details. We will do our best to accommodate your request but we cannot guarantee the order will be cancelled. Tracking numbers are not "active" until the order is scanned into the carrier hub in the evening. This listing is currently undergoing maintenance, we apologise for any inconvenience caused. The item "Intex 2650 GPH Saltwater System & Sand Filter Pump Swimming Pool Set 28679EG" is in sale since Thursday, August 18, 2016. This item is in the category "Home & Garden\Yard, Garden & Outdoor Living\Pools & Spas\Pool Equipment & Parts\Pool Filters". The seller is "windycitysuperstore" and is located in Round Lake, Illinois. This item can be shipped to United States.